This project involved the design of a 1,700-ton chiller plant to serve multiple buildings in the Traditions Area of the BGSU campus. In order to incorporate the new chiller plant, the Centrex Building (constructed in 1915) was significantly renovated, including the removal of a section of roof so the towers would be in a less visible location. In a Phase I infrastructure project, electrical service was upgraded to support the new chiller plant and to eliminate portions of the campus 4160V service. 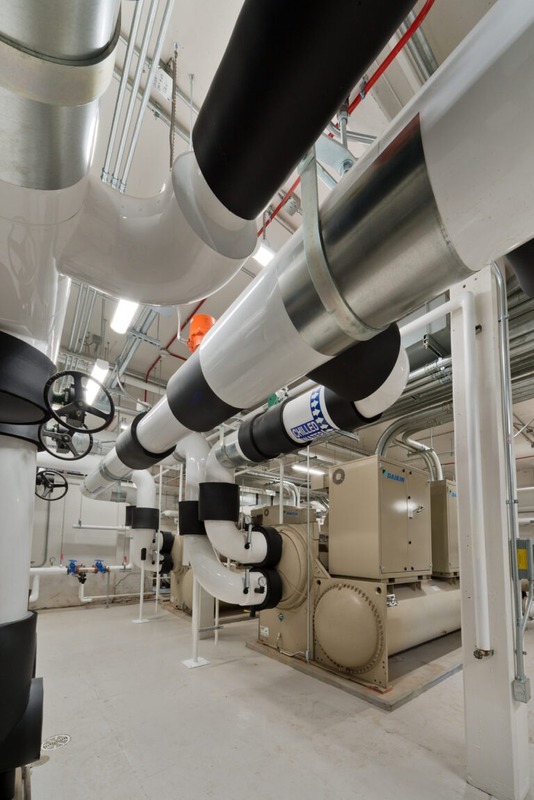 This project also included the extension of thousands of feet of CCP-2 direct buried chilled water piping to Williams Hall, Shatzel Hall, McFall Center, South Hall and Founders Hall. The existing chiller plants in these buildings were removed, and pumps, piping, controls, etc. were added to convert the building chilled water system from a standalone system to one connected to Central Chiller Plant #2. HAWA provided HVAC, plumbing and electrical engineering services and provided construction administration services as well. At the completion of construction, HAWA commissioned the mechanical and electrical systems, working closely with the controls contractor to optimize efficiency.